**** Chosen by Winner: Jay G.
Dan Stucky is an accomplished tactical folder maker who has donated one of his Large Tactical Folders. The folder features a 4.25-inch blade of CPM 154 high carbon powder metallurgy stainless steel, hollow ground with a mirror finish. The frame is Titanium with a Titanium linerlock and tip up pocket clip. 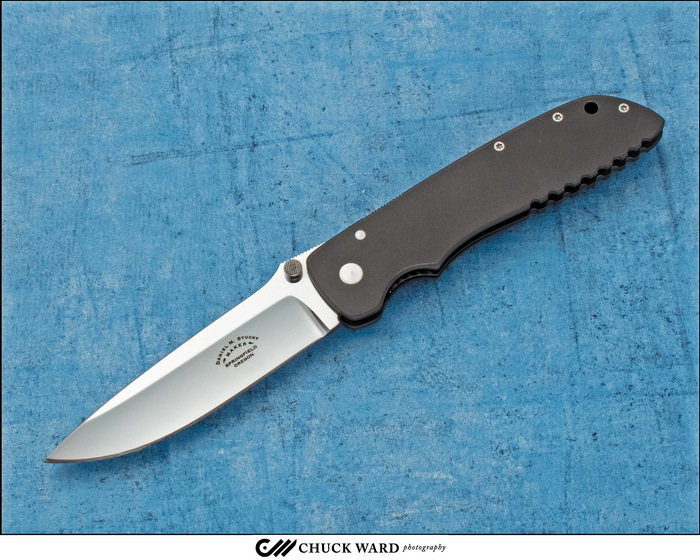 Sticky points out that "my knives are made one at a time by hand. No parts are water-jetted or CNC machined." Dan Stucky lives in Springfield, Oregon with his wife, Judy, and two labradoodles, Freddie and Lily. In 2001 he retired from the Springfield Fire Department after 32 years of service. During the spring and summer Dan guides on the beautiful McKenzie River where he teaches people the art of fly fishing and he has been a member of the McKenzie River Guides Association for over 35 years. When not on the river, hunting or traveling, he spends full days in the shop with his nose to the grindstone. Dan has always been an outdoor enthusiast. Bow hunting, fishing, guiding and exploring are a way of life. Naturally he needs a good knife whether it is to skin an elk, clean a trout, fillet a steelhead or slice a tomato for lunch. As a bow hunter he had first-hand knowledge of how a knife should perform and has developed knives that are not only good to look at, but hold a wicked edge. Before retiring from the fire department he began making and selling custom knives. His skills are continuing to improve and his lines of knives are expanding resulting in several awards at various knife shows.